A natural approach to supporting your child through the coughs and colds, ear aches, tummy upsets and mild infections that are part of growing up. Mother of two, paediatrician Dr Leila Masson has a busy medical practice and lectures around the world on children’s health. 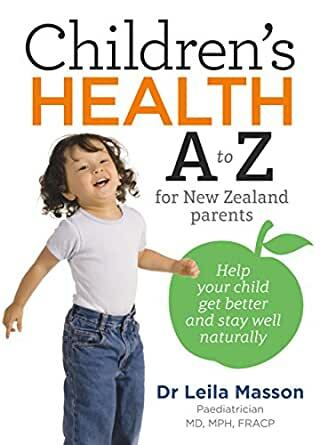 In her book, the A to Z of symptoms covers the common health problems children and their families encounter and is set out in an easy-to-follow format with questions to ask and ways to care for your child, including when to seek the help and advice of a health professional. Dr Masson also discusses the basics of children’s health and how parents can support their children’s wellbeing through providing optimum nutrition, sleep, outdoor play and a healthy home environment. Throughout the book, and in the ready reference section at the end, there is useful information on how to take your child’s temperature, how to help them to take medicines, how to get children to drink more water, allergy testing, relaxation exercises and more. All this is extensively indexed and cross-referenced so that you have the trusted knowledge you need at your fingertips.